These moist and delicious strawberry cupcakes are packed with fresh strawberries and topped with an easy to make, and completely addictive buttercream. I guarantee, they’re sure to please! Strawberries are finally in season and I’m so excited to use them! I can buy strawberries year-round but the ones available in the winter look beautiful but have very little taste, which is beyond disappointing! I whipped up my favorite vanilla cupcakes and added in tons of chopped strawberries; so easy and delicious! The cake is topped with a pretty little dollop of strawberry buttercream and a trio of sliced strawberries accompanied by a sprig of mint. 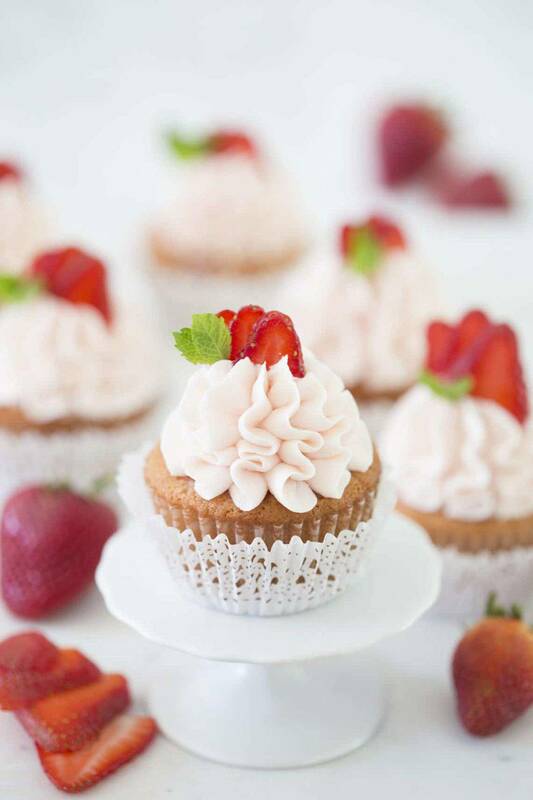 Have you ever had an amazing strawberry cupcake? I hadn’t! The ones I tried always had some artificial taste to them, which is something I just can’t handle. 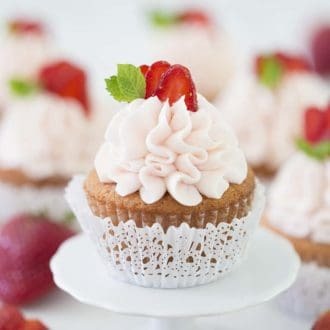 I think the problem is if you use fresh strawberries then the cupcakes aren’t going to last long, which is not good for a bakery or distributor but matters not to the home baker! This is especially true when the cupcakes will be gone in the blink of an eye. Even my ULTRA PICKY eater husband loved them and keeps asking if there are any more stashed away. How do I puree strawberries? Wash and dry your berries. Hull them and cut in half. Place in a food processor or blender and pulse until liquified. You can intensify the flavor by simmering the puree, which also reduces the liquid. How do you make strawberry buttercream? Add strained strawberry jam or a strawberry reduction a tablespoon at a time you a batch of unflavored buttercream a tablespoon at a time until the desired taste and consistency is reached. 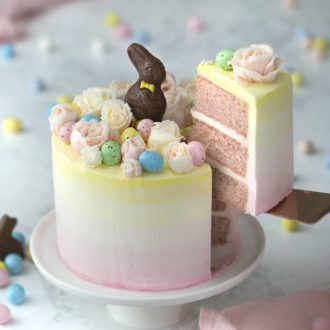 American buttercream works wonderfully with the zingy strawberry flavor but Italian and Swiss meringue buttercreams are wonderful alternatives for a lighter, less sweet frosting. I’ve gotten lots of questions about the lace cupcake papers so here’s a link for them! These cupcakes were taken RIGHT to the edge of how much moisture you can add to a baked good. I made a few batches with varying amounts of strawberries mixed in and here’s the deal. If you mix in a cup of strawberries then the batter is too dense to rise much and it’s just too liquidy, 1/2 a cup and they rise just fine, 3/4 a cup and they’re struggling but they eventually bake and the tops are not domed, more flat maybe even a bit concave. My recommendation is to use between 3/4 and 1/2 a cup of the chopped strawberries in your bater. That way they have the maximum taste but can still bake and set. I’l also point out that a tiny drop of soft pink food coloring was added to the batter to get a nice believable shade of pink. Totally optional but I liked the visual effect. I used a large closed star 858 tip to pipe the dollop on top but really they only need a little smear of buttercream. For a healthier version of this recipe skip the buttercream and drizzle on a strawberry glaze made from confectioners sugar and strawberry juice. I enjoyed the taste imparted by the preserves but if you want to get fancy, or have a bunch or strawberries hanging around then try making a strawberry reduction to flavor the buttercream! Smash the berries a bit and simmer for a while to reduce. Strain the mixture and cool before using. 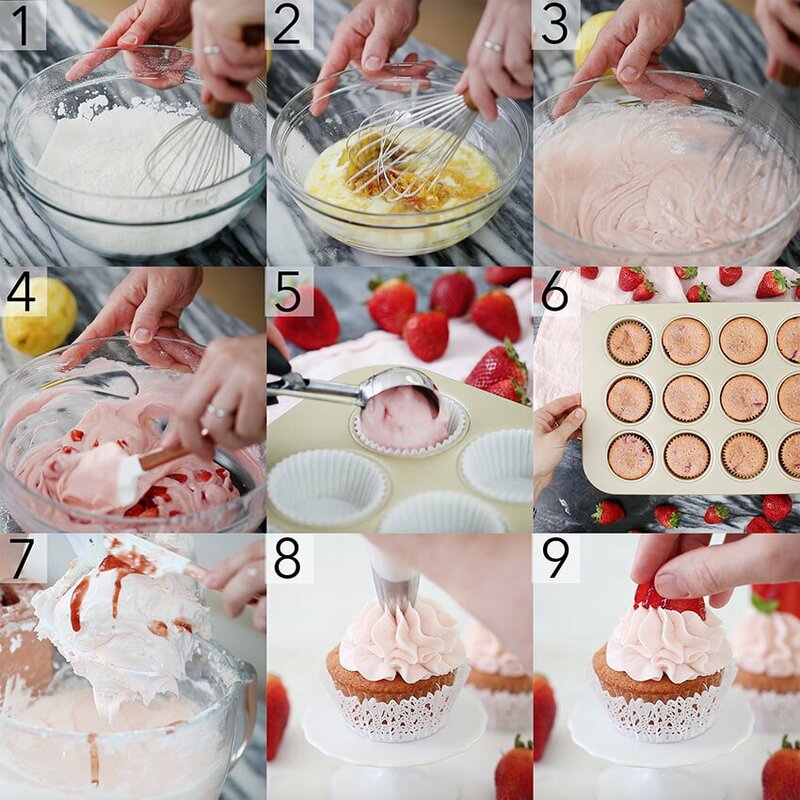 How do you make easy strawberry cupcakes? Preheat oven to 350F. Add cupcake sheets to a pan. Warm and strain the strawberry preserves. Some will be used for the buttercream. Zest a lemon. Sift dry ingredients (including sugar). Whisk to combine. In another bowl, whisk together wet ingredients (including lemon zest). Combine wet and dry mixtures. Whisk until combined. Add a few drops of pink food coloring until a desired consistency is reached. If the batter is lumpy, it’s okay! Fold in fresh strawberry chunks. Add batter to cupcake papers. Bake for about 30 minutes or until the centers are set and springy to the touch or a toothpick comes out clean. In a stand mixer, cream the butter until fluffy. Sift in half of the confectioners sugar. Mix, then add the rest. Add in 1 tbsp of strained strawberry preserves. Mix until combined. Use food coloring to dye the buttercream a blush pink. Transfer the buttercream to piping bag fitted with a large star tip or an 858 tip. Pipe the a large dollop onto each cupcake top. Use the smaller strawberries as the garnish. Cut into three thin slices. Gently fan and place the slices on each top. Add a few mint leaves. I used the smallest tips of the mint sprig. 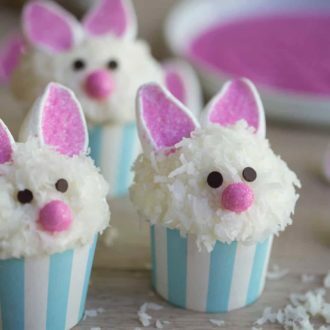 If you’ve tried these cupcakes then don’t forget to rate the recipe and let me know how you got on in the comments below, I love hearing from you! 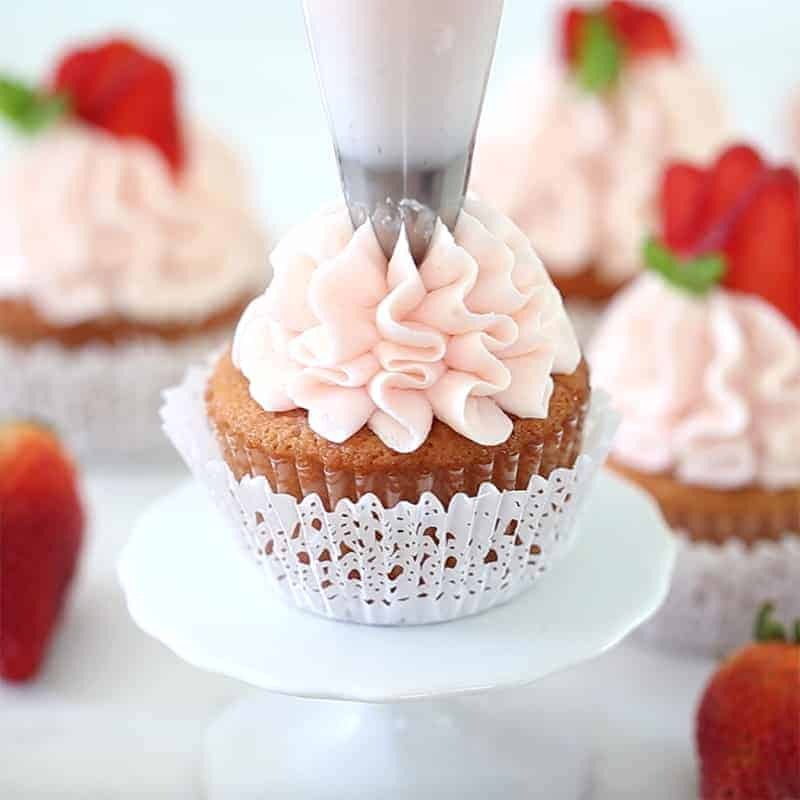 These moist and delicious strawberry cupcakes are packed with fresh strawberries and crowned with an easy to make and DELICIOUS strawberry buttercream. Preheat oven to 350F. Add cupcake sheets to a pan. Warm and strain the strawberry preserves. Some will be used for the buttercream. Zest a lemon. Sift dry ingredients (including sugar). Whisk to combine. In a stand mixer, cream the butter until fluffy. Sift in half of the confectioners sugar. Mix, then add the rest. Add in 1 tbsp of strained strawberry preserves and salt. Mix until combined. Use food coloring to dye the buttercream a blush pink. Transfer the buttercream to piping bag fitted with a large star tip or an 858 tip. Use the smaller strawberries as the garnish. Cut into three thin slices. Gently fan and place the slices on each top. Add a few mint leaves. I used the smallest tips of the mint sprig. These cupcakes were taken RIGHT to the edge of how much moisture you can add to a baked good. I made a few batches with varying amounts of strawberries mixed in and here's the deal. If you mix in a cup of strawberries then the batter is too dense to rise much and it's just too liquidy, 1/2 a cup and they rise just fine, 3/4 a cup and they're struggling but they eventually bake and the tops are not domed, more flat maybe even a bit concave. My recommendation is to use between 3/4 and 1/2 a cup of the chopped strawberries in your bater. That way they have the maximum taste but can still bake and set. I'l also point out that a tiny drop of soft pink food coloring was added to the batter to get a nice believable shade of pink. Totally optional but I liked the visual effect. Sounds delicious! 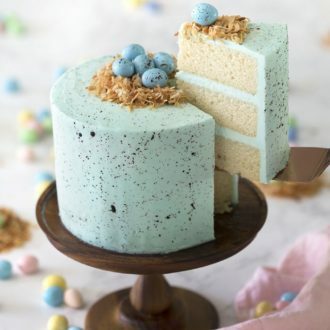 Can this be made into a 3-tier cake? Also, did you make your own strawberry preserves for this? Thanks! It can be made into a three tier cake using 6-inch cake pans! If you want to use larger 8-inch pans, double the recipe! I didn’t make my own preserves! I used Strawberry Bonne Maman! SO yummy! Hope you enjoy! Absolutely beautiful!! 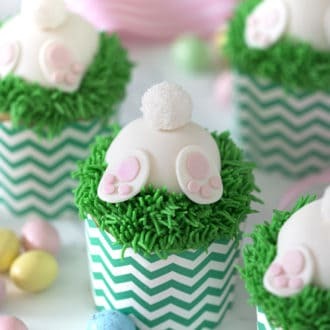 I love the lace cupcake liners/cups!!! Where did you get them? Omg these were sooo delicious! I’m in love! Deliciosos… he hecho tres recetas tuyas y todas perfectas , me fascina 🙂 gracias. I’ve done it!!!! But !!!! My cupcake raised too much like a muffin now… how come? You may have overfilled the cupcake tins!! Next time add smaller amounts to each paper! I absolutely can not wait to make these! I am just starting to bake again and I always go to your channel to learn thing. I was wondering if you could do a video or blog post on handling real moist cakes (such as rich chocolate) I let my rest for 30 minuets and then freeze them before I assemble my cake and they seem to fall apart sometimes. I just wonder what I am doing wrong. My vanilla sponge cakes never do this to me! Thank you for all your great advice. I am a big fan!! Thank you for your kind words! With moist cakes I really let them sit for a bit before removing them. Using cake strips helps a lot too so they don’t stick to the pan. That can cause them to fall apart. You can check out my video on cake strips and how to make your own! AWE MY PLEASURE JOHN! YOU ARE SUPER TALENTED AND I REALLY LOVE EVERYTHING YOU DO! 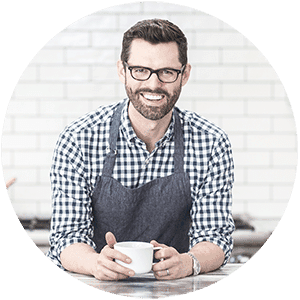 THANK YOU FOR ALL OF YOUR WONDERFUL RECIPIES AND BLOG POSTS. I WILL TRY YOUR ADVICE ON MY CHOCOLATE CAKES. THANKS AGAIN! THANK YOU SO MUCH REGINA! Of course! I am very glad you enjoy them and I hope that works out for you! Can you use preserves instead of strawberries? And what can you substitute sour cream for? Yes, you can. Use the batter recipe from my strawberry cake, which uses the strawberry preserves. Also, yogurt is a great substitute for sour cream!